1. Place the nuts in a food processor and blitz until smooth. Add the feta, yogurt, herbs, olives and preserved lemon, and blitz until you have a slightly coarse paste. Season and transfer to a serving dish. 2. 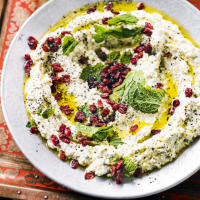 Garnish with barberries, the extra mint leaves and a drizzle of oil, and serve with the flatbreads.